Relaxing and romantic. Since the times of the ancient Egyptians, aromatic oils have been used to promote health, beauty, fertility, virility and of course, romance. So to help you create a romantic atmosphere for you and your partner, we've created this seductive blend of exotic aromatics including Ylang Ylang, Patchouli, Ginger and Grapefruit. The floral aroma of Ylang Ylang Essential Oil is considered an effective aphrodisiac and reportedly helps with impotence and frigidity, and Ginger has long been used to spice up relationships. Patchouli stimulates the body's hormones, so this makes another perfect addition to this romantic blend. A twist of Grapefruit brings an uplifting splash of citrus to the party! 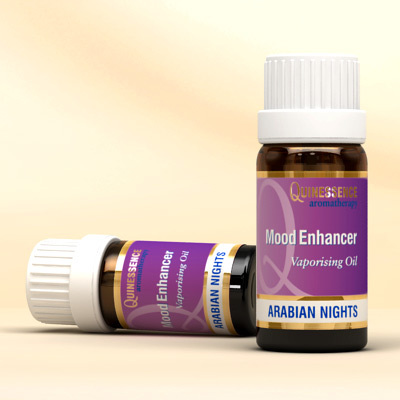 This unique blend of the most popular aphrodisiacs used in aromatherapy today is skilfully brought together to recreate the mystique and mystery of the ancient orient for you. So light a couple of candles, put on some appropriate music, and add a few drops of this exotic mood enhancer in your vaporiser. The rest is up to you . . .